18th. August 2011: A beautiful day! 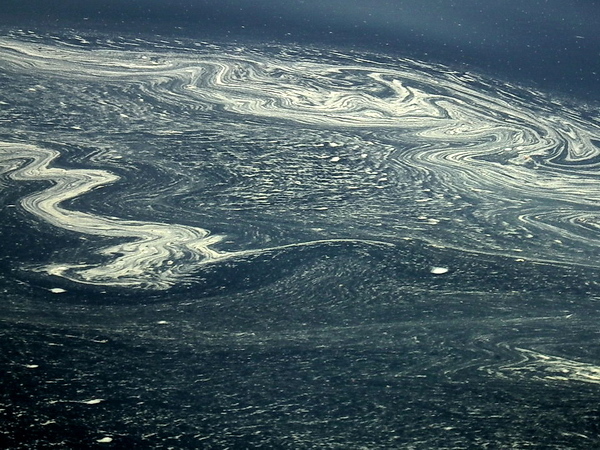 3rd June 2012: Risk of Algal Bloom. The water is Lough Allen’s most vital asset. As long as it remains clean, then all will be well for us, for cattle and other animals, for wildlife and plants. Lough Allen’s water has historically been clear, rich brown, soft, healthy and free from major contaminants. Its quality comes from a regular supply of rain, largely undeveloped and undisturbed uplands, stable pasture-based farming methods, and a lack of heavy industrial operations and extraction projects in recent years. These qualities are important to all of us. But can we be assured that the Lake will always remain so? Lough Allen can be an economic force for agriculture, for tourism, for research and study, but any such benefits will only be heightened if we regard Lough Allen as a ‘very special place’ and accept that the water that flows through it, and sustains life in it, is the basis of that economic well being. If we allow water quality to deteriorate (for short term expediency) don’t we lose part of that social and economic future? Of course, Lough Allen is also steeped in heritage, history and natural history. We, for our part, have focussed on the latter. For a vibrant natural system the present good water quality needs to be maintained. Indeed, we should do whatever we can to improve it. It is, by far, the cleanest lake on the Shannon system and the one with the greatest biodiversity. However, we cannot assume that even a large body of water, like Lough Allen, is totally immune to damage. 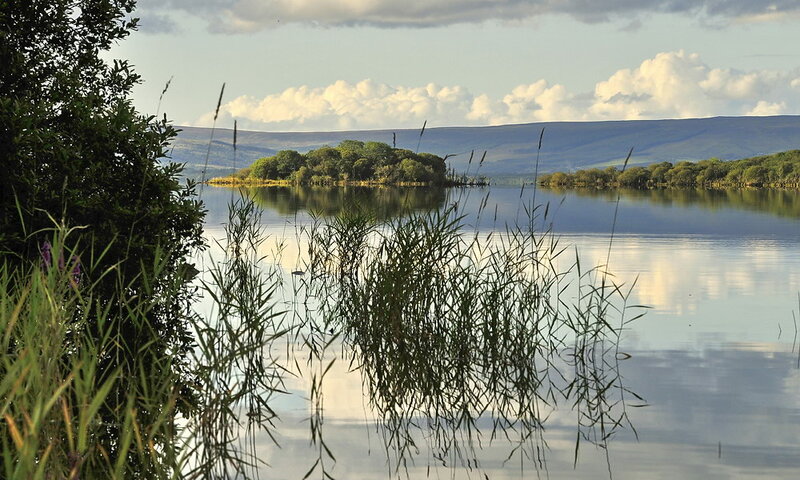 In this page we discuss the water of Lough Allen in its natural situation, the possibility of a decline in quality, and the vigilance and observation that we have witnessed among people who care about it. We have been motivated to produce this page in response to a worrying, albeit temporary, change in condition during the Spring, and by the forthright and concerned comments we have had from many people living or spending time around the Lake. It is great that people are so alert and have shared many ideas and observations with us. Here, we have added a few observations of our own and, hopefully, we can all work together to make sure that Lough Allen and its water stay very special for many centuries to come. Lough Allen’s water is nearly always dark brown or the colour of Ginger Beer! It can be very clear with deep objects showing up as darker and darker shades of brown. The larger inflows from the north come off bogland, hence the colour. Bright brown water and streams also enter the lake. This is Iron coming from thick sandstone beds with included round ironstones found in the upper strata of the mountains surrounding the Lake. It is entirely natural, does no harm to the lake, and possibly contributes in some complicated way to its character and its wildlife? But, by and large, Lough Allen’s water is clean and clear, beautiful and stormy, or still and quiet. Many of the shores are pristine and great for swimming (though, obviously, we are not in a position to endorse that everywhere). The social and economic infrastructure of the area should pose no reason for either incremental or sudden addition of harmful materials or contaminants into the water. It is important that in generations to come we can still present pictures to the world of Lough Allen in all its beauty, very much as shown by the 3 views shown here. It is also important socially (fishing, swimming, recreation) and economically (specialist tourism, farming, food) that a pristine environment still exists in 2020! 3 seconds... and all the Foam is gone! The picture above shows Lough Allen on a stormy day. Significantly the date was 23rd of May. This was over a month after we had reported concerns about foaming on the Lake. There was no unnatural foaming on this date. No persistent dense white foam was left by these waves. The Lake was clean! Why? We were so impressed at this time that we took a series of animated photographs (shown LEFT) over a period of 3 seconds. These show a wave breaking and receding, some large bubbly foam left on the shore, and then all breaking up before the next wave arrived. This quick dispersal characterises foam on water derived from natural processes. Unfortunately, the dense white foam (discussed below) has come back since then! The illustration below gives an impression of Lough Allen. It is a cross section of the lake showing its depths along a line east - west from the west shore near Tarmon straight across to the east shore. (Sampling was done along the 20000 north Grid line.) Like much of the surface detail in its islands and surrounding shore there are many rises and hollows on the floor of Lough Allen. They can hardly be described as hills; think of them as being like Corry and Drummans Islands... but underwater. Please note the scaling on the chart below. The max depth is 35 m. but the width of the Lake at this point is close to 5 km. The data has been reproduced this way for practical reasons but also to emphasise the undulating gentle curves of its floor. The greatest depth in Lough Allen is just over 40 metres, and it is a very restricted location. There would be considerable areas greater than 20 m. but also large areas of shallows. It is nigh impossible to evaluate the volume of water in Lough Allen, not to mention the amount of water that passes through it over any given time. Very roughly we could say it has a surface area of something like 39 sq. km. A reasonable water level in a dry Summer would be 1.8 m on the datum at Drumshanbo lock, though it can go lower. In a wet winter this level would rise to 3 m. or more. This means there is a vertical height of water of 1.2 metres that comes and goes fairly quickly depending on the weather. This makes no allowance for greater variation around the heights selected and absolutely no assessment of the volume of water below the lower level that is held in the lake more or less permanently. If we work out these sums it means that that volatile band of water contains in the region of 46.8 million cubic metres of water. That’s 47 million of those big square tanks-in-cages that farmers store water for cattle in out in the fields? It is a huge volume of water! This gives Lough Allen a great reserve and a great tolerance for periodic droughts and incidents of contamination. It is hard to visualise how it could ever become less than pure and pristine! Lough Allen’s rare orchids grow on the waterline. So, every year at this time we are anxious to see it recede somewhat. The orchids grow over a relatively narrow band of shoreline in and around the 1.8 m. level we talked about above. They may suffer from the water being too high in the early Summer or, alternatively, their flowers may be covered just as they have opened by the rising lake level. Either effect will stop them reproducing for another year. Hence the reason why they are said to be so periodic. In good weather the lake can drop 1.2 metres in height within a couple of weeks, and it can fill up even quicker — as we have discovered in recent years. Each of these changes means that a volume of water similar to what was estimated above has flowed through Lough Allen and the sluices at Holly Island. Maybe there’s a good energy source for us in these rainy times? It would seem desirable both for conservation purposes and to try and control flooding, that the lake level should be allowed drop during the Summer time. There would still be adequate water for the limited navigation needs and it would be much more preferable where possible to try and provide a buffer against catastrophic late Summer or Autumn flooding? Since 2008 Lough Allen has been classified as Mesotrophic whereas before the lake was declared Oligotrophic. The Invertebrate fauna of oligotropic lakes would typically be dominated by stoneflies, mayflies and midge larvae. Salmonids are the major fish found. On the other hand eutrophic waters contain large numbers of worms, leeches, snails and coarse fish such as Carp. So being mesotrophic Lough Allen would have some characteristic of both categories It means that Lough Allen has a higher level of nutrients present than previously thought. The Environmental Protection Agency catergorises lakes all over the Ireland into four types, oligotrophic (low nutrients and productivity), mesotrophic (medium productivity), eutrophic (high productivity) and hyper-eutrophic (areas with too much nutrients resulting in extreme algal blooms). The new evaluation of Lough Allen suggests that there is medium amount of nutrients present that can be used for uptake by plants (algae, aquatic plants) and animals (invertebrates such as mayfly larvae and water beetles). The water of Lough Allen might also be regarded as dystrophic in part due to the high levels of brown water entering it from surrounding bogland. Such waters can be low in fish stocks. There has been no change in water type and the nature of the water may not be the reason why Pollan (for example) are present. The EPA re-description of the characteristics of the water in Lough Allen simply reflects the status quo. It does not automatically mean that the water is becoming enriched. 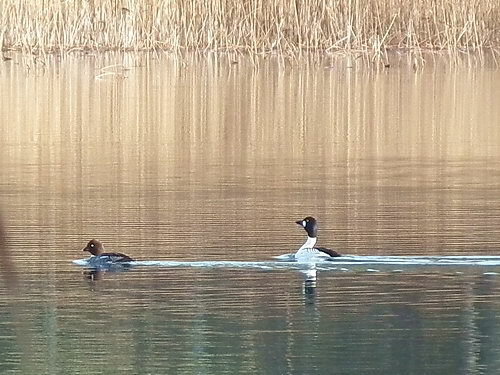 This is to date unproven though it is something we may fear following recent signs of deterioration in water quality and it would be a possible risk factor to special Lough Allen species such as Pollan, Orchids and Mergansers (among others). Being mesotrophic ‘now’ may simply mean that Lough Allen is monitored using different parameters? Water classification should not affect Pollan as long as the lake is maintained and managed correctly. If this is not done the lake could easily become a eutrophic lake. This can happen by the addition of nutrients through processes such as wastewater effluent, surface water run-off, agricultural spillages, etc. More accurate classification of trophic level and more accurate observation and management of change may be a positive for Lough Allen water quality but only time will tell how it may, or may not, affect the rarer species which inhabit the lake’s water or which inhabit the lake’s surrounding shores. According to Inland Fisheries Ireland (Shannon River Basin District) the main water body of Lough Allen is considered slightly alkaline but mainly neutral ranging in pH from 6.5 to 7.9, where 7 is neutral, below 7 is acidic and above 7 is alkaline. This is a positive outcome for fish families such as the salmonid and corygonid species (including trout and pollan) which are extremely sensitive to changes in pH and prefer a optimum pH of 6.5 to 7.5. If the pH falls any lower or climbs any higher the spawning of the salmonid families may be affected resulting in lower numbers of eggs hatching and lower number of the different species within the family as a whole. pH within a water body can affect the solubility of other compounds such as nutrients in the water which in turn may afffect the growth and reproduction of aquatic plants and animals. pH can also allow pollutants to become more soluble in water bodies, affecting the cleanliness of that environment. Luckily for Lough Allen, pH does not appear to be a problem for this lake and does appear to be at optimum levels for our more sensitive family, the salmonids. 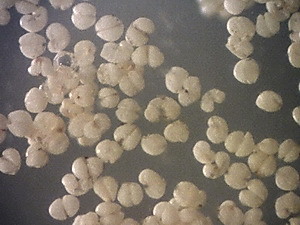 The ideal water quality for the Pollan (Corygonus autumnalis) is not known but, it is assumed, that their presence here is more to do with glacial activity during the last Ice Age isolating a population here. In Siberia the population is anadromus. i.e. it migrates from river to sea. iii) Rivers, inlet and outlet. 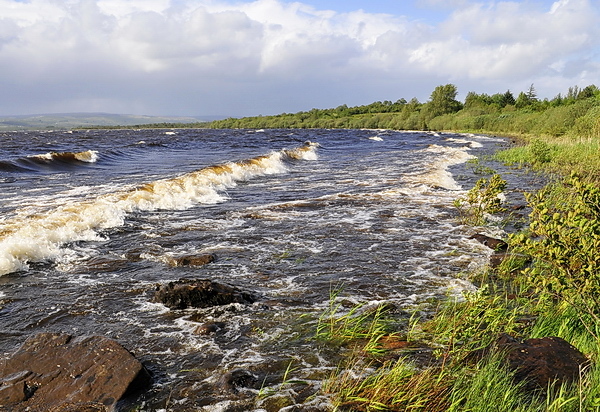 The main rivers entering Lough Allen are the Shannon, the Diffagher, the Owengar and the Arigna river on the north and west shores, with the Yellow River and Stony River on the east shore. Of these the Shannon is a possible source of municipal sewage, the Owengar was famously affected by a mudslide associated with installation of wind turbines but has now recovered and may be healthier again. The Arigna river is prone to carrying a certain amount of suspended coal dust, and agricultural run-offs have been noticed in the Diffagher. It seems highly desirable that stringent steps should be taken to protect these rivers both for their own sakes and to reduce the risk of them adding damaging nutrients to Lough Allen and possibly reducing water quality in years to come. The richness and biodiversity of both rivers and lakes depend on this and, in the case of the Owengar, a greater appreciation of the delicacy of the upland geology and its sensitivity to any further major engineering works. Water will always change, from year to year, season to season. It’s a natural cycle associated with rainfall, and the growth and decay of plants and animals. The deposit of green algae shown on the Right is possibly a natural occurrence. However this deposit was larger and more extensive than we have ever seen around lough Allen. A good tip we have come across for classifying these deposits is to use a ‘fork’. If it picks up long green filaments, then you are probably dealing with a ‘green alga’ rather than a, perhaps more pernicious, bloom of what is commonly called blue-green alage. Green algae may quickly grow where the water is enriched and heated. e.g. a shallow lagoon near a Gull colony! But this is temporary. If green algae develops in greater amounts over a widespread area it probably indicates that the lake as a whole is being enriched — which is definitely undesirable. Water quality and nature will, and does, change. Lough Allen and much of its surrounding area is formed by glaciation; just as the great glens of North Leitrim were formed. They were gouged out by ice moving south — in the case of Lough Allen. Although the rocks are almost entirely Carboniferous, they are not predominantly limestone as one might expect. They are shales and sandstones and these make the water quality softer than found in limestone lakes and reduce the likelihood of such species as Pearl Mussels and Crayfish occurring. These species are found in more alkaline waters further north. Such variation in water quality is natural and occurs over distance or time. Rapid changes in water quality would rarely be natural and, nowadays, tend to result from man's use of the environment having an impact on the natural system. Where such changes are harmful, avoidable, and directly linked to recent developments in an area, we tend to see this change as unwelcome and polluting. Several years ago, we suggested to a Consultation Process organised by Leitrim County Council on a draft programme for Lough Allen that we should draw on the pristine nature of the lake's environment and use it as a backdrop for a 3rd. level programme on the best practice for Waste Management in a non-industrialised Rural area. Many such areas exist throughout Europe and, working with an existing College, such a 3rd. level faculty course could be run in Drumshanbo. At the time of this proposal we were not aware of any significant deleterious change in the quality of either the environment or the water in the Lough Allen Basin! In the last 3 years, unfortunately, we have noticed change particularly in the water quality. Also, this change is rapid, and this year it is everywhere to be seen and being commented on by many we meet. We are not sure of the causes of such change and have worked with various statutory bodies to seek to identify and assess it. After a bad Spring, the early Summer looked hopeful but at the time of writing (June 2011) signs of contamination are widespread. We list these changes below and describe how we assess them. Many people have already commented on these signs and sent us evidence of what they have seen. We appreciate this, and this is why we want to publish this page... a) to share existing information, and b) to encourage people around the lake to be vigilant and watch out for changes in the water like they have never seen before. OK, so you are wondering what is the point of all this? As mentioned above, there are signs that an incipient deterioration of environmental quality may be in process. These signs are very fleeting, leaving little hard evidence, and are very difficult to prove. However, the history of many waters is one of early signs being missed until a major (and very obvious) problem occurs. It would be great to nip any problems in the bud in the case of Lough Allen. Lough Allen is also being carefully monitored in physical terms on a continuing basis. But there are increasing levels of contamination entering the lake, as shown by the lake’s unusual reaction in stormy weather. All these sources of contamination cannot be natural! We feel, that with the small population around the lake, it should be possible to contain or treat any unnatural effluents entering the lake. We would strongly advocate treatment of all community waste water through a reed bed system such as seems to have been very successful in neighbouring Lough Meelagh. These can be combined with a Nature Reserve like we have seen at Rye Meads in England. 1. Foam... this is increasing. All lakes will have foam in them. It forms streaks running the length of the lake. This is often natural but may not always be so! We discuss the differences between 'natural' foam and 'unnatural' foam below and suggest practical guidelines as to how they may be distinguished. For the purpose of this section we are talking specifically about 'unnatural foam'. This has been observed in small pockets in different parts of the Lake over the past 3 years. However, it was never so bad as seen and witnessed on 1st. of April, this year, along the north shore of Lough Allen. Foam was being driven the whole length of the lake from Drumshanbo and was being deposited in waves on most south facing shores from Kilgarriff to Corry Strand. What was disturbing about this foam was that it did not disperse when it landed on the shore but piled on top of itself and persisted over many days. This immediately struck us as being unnatural and raised our concerns. The colour, the size and density of bubbles, and their unwillingness to burst, immediately said 'chemicals' to us. But then again, we cannot prove that it was pollution; we have not definitively found the source! On the other hand, what natural source could bring about such an incremental change, and a comparatively rapid change (especially this year)? 2. Algal Blooms. Widespread early in the year. Algal blooms occur where a lake has material added to it that acts as a fertiliser for tiny algal organisms found in all water. Typically Nitrates or Phosphates, these can trigger an explosion of growth in algae until such time as they colour the water and cause a bloom. We have seen severe algal blooms in other lakes in this region. Lough Allen is a big lake with a considerable proportion of deep water. Such a large volume of water should be able to absorb considerable quatities of added material before it triggers signs of eutrophication. Does the occurrence of algal blooms this year, so far not severe and quite dispersed, indicate a persistent accumulation of enriching agents to a level that it is widely available to promote algal growth? Blooms so far observed have been in calm water towards the centre of the lake, areas where foam and scum also seem to concentrate. The biggest algal bloom we have so far seen was on the 14th of April, a calm day with ruffled water either side of the lake and a narrow flat current down the middle. In this calm water travelling for at least a kilometre north - south there existed a line of scum roughly west of Cormongan. On either side of this thin line of scum were wide tracks of water totally occupied with linear colonies of probable blue/green ‘algae’. This streaking is typical of the start of an algal bloom but the bloom had not reached a density where it had become a continuous pea soup. A lake with streaks of algae can very quickly become a lake full of green water! Everytime we have a warm day with calm water we meet green algal clouds in the flat water. Fortunately this has been a cold, wet, windy Summer and these conditions tend to disguise the amount of algae in the water. But when it can be seen it is not something WE have seen much of in Lough Allen in our 10 year knowledge of the place. If others can further advise us on this point... please do! The photograph on the right shows a phenomenon we came across in late April after foam deposits had been left on a beach north of Cormongan. 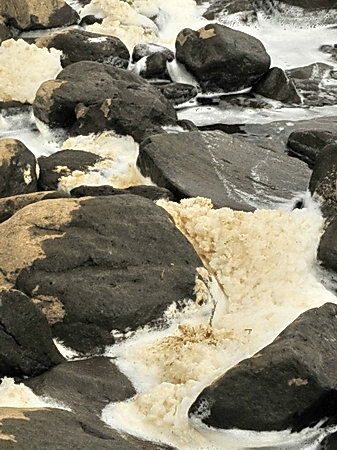 These ‘stalactites’ had formed on several boulders that just happened to be the right height for the water level at the time of widespread foam. We knew from professional advice we had been given that it was going to be hard to identify any cause for this foam due to the high level of dilution. Could these stalactites provide the answer? How are stalactites formed? By large amounts of water flowing down a rock face and dropping off leaving small amounts of minerals behind over the years! Could these stalactites be a way of collecting concentrated material or agents that were in the foam? Well, we tried and, much to our surprise, found that the stalactites were entirely compsed of microscopic spherical objects — all looking very similar. We now believe this is Conifer pollen present independently of the algal bloom. (June 3, 2012) The powder is natural but the bloom is unnatural pollution! This golden brown material can also be detected as thin lines in the sand in other places where foam had landed. 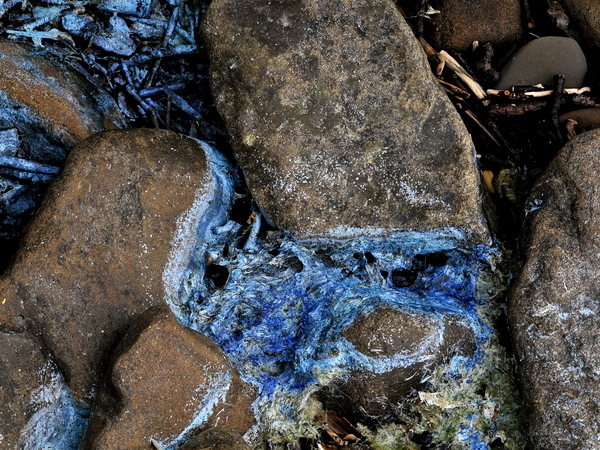 This yellowish powder has been associated with algal blooms, is always found with the foam, and where that foam was deposited in large quantities went on to form vivid blue deposits as it dried out — indicating Cyanophyceae (or blue green algae). Our conclusion: this foam contains enriching material (most likely phosphates), of a natural or synthetic (detergent) source, that allow large quantities of algae to grow, and die, and get washed up. Another theory is that the algae are blooming for some other reason and their activity is releasing material that is then causing the foam. But what 'natural' factor would cause an algal bloom in a large lake so early in the year. Was the high winds at the time a possible dispersal factor? 4. Shoreline Deposits. "What are all these blue streaks?" 5. Sediment in water, river and lake beds. Fine shaley sediments are part of Lough Allen. They are entirely natural. They come from the Belvally and other shale beds that occur on the shore and in the hills around Lough Allen. This shale is particularly friable; you have only got to look at it and it crumbles! Other less naturally occurring depositions that we know of around Lough Allen would be coal dust coming down the Arigna River and a large amount of 'mud slide' material entering the lake via the Owengar river. This latter material may be natural but it may be present in unnatural quantities. 6. Folk memory or observation. People are noticing this! We have often hoped that we would come across an old record of some ephemeral white flowers appearing on the shoreline at the end of Summer and providing the evidence as to how long Lough Allen's remarkable Lady's Tresses Orchid have grown here! But, no luck so far. But, many people are commenting on the growing pollution seen on the shore this year, particularly the blue/green algal deposits. (It has a very striking colour!) The fact that people have observed this, are commenting on it, and seem concerned about this change, all lead us to one conclusion. This is not a regular or natural event - but one that people have never witnessed before in their lifetimes! No, it is something new that is upsetting the fine balance that is the water of Lough Allen. Whenever water is disturbed it will form bubbles and this can lead to foam. If the water is crystal clear and there is no contaminant at all in it, these bubbles will disappear as quick as they are formed. There is no natural or artificial element present to maintain the surface tension that a bubble needs. (Have a look at our cycle of breaking waves pictures again?) 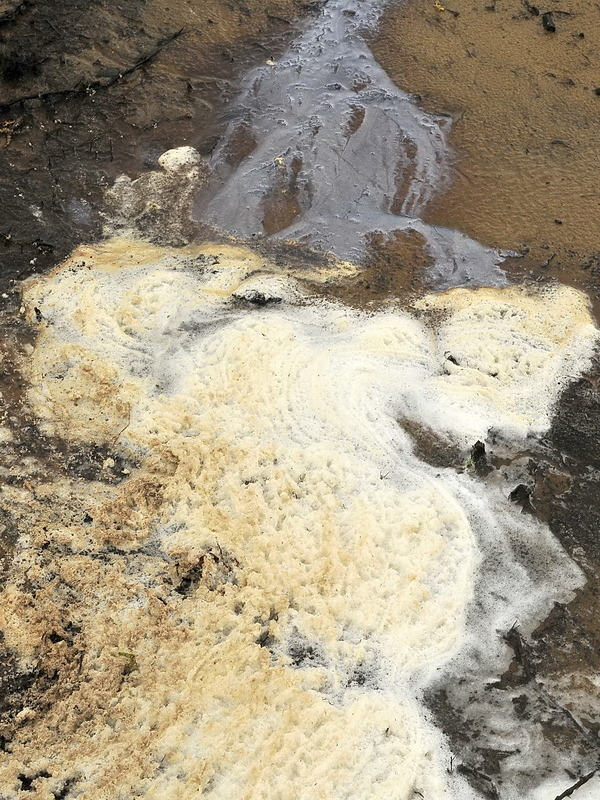 Many streams and rivers in Ireland at various times of the year will gain natural chemicals (or surfactants) that will heighten the ability of that body of water to sustain foaming. In linear lakes when the wind blows along its length, long streaks of foam lines are a typical feature of the Irish environment on stormy Summer days. However as a keen birdwatcher for over 50 years and a frequenter of the sort of places birdwatchers frequent, it is safe to say that this natural foaming has certain qualities... and ‘synthetic foam’ has different qualities. Dismissing a new and significant foam problem as ‘natural’ may be unwise. It may be plausible but it may be best to consider other options first. Why is it new? Why is it more abundant than other years? Is there any quality about it that makes it different from what we have seen before? Many people will have an innate awareness of what is natural in their place... or in any place. People do not need to be technical or specialists to notice change; they just need to be observant. And people who work and live with nature are observant and sensitive to alterations in their surroundings. We are passionate believers in 2 basic truths... sudden change does not occur in a natural environment without a profound cause, be it man-made or natural (mudslide, avalanche, earthquake!). Secondly, people are well equipped to notice change and if it is fairly rapid it will be noticed very quickly. Personal observation over a number of years by an individual or individuals who are living through it, will often be more accurate than even the most accurate and technical of scientific tests that can only be applied periodically and has no recognition of the way things used to be before that testing started. To ensure the maintenance of the quality of the water in Lough Allen we think the greatest asset is the vigilance of the fishermen and those people who reside on its shore. We are continually amazed by the number of people who have commented directly or indirectly about the appearance of those blue areas of contamination on the shores of Lough Allen in recent weeks. Unfortunately, after a short period when the Lake seemed cleaner, there is once again a fair distribution of foam all along the lee shores and in the lake itself. We remain unconvinced that this is entirely of a natural origin. We would accept that nature has perhaps had a part to play. Possibly this strange Summer with cold, wet and very windy weather, has contributed to disturbing in an unusual manner the lake bottom that may have held a residue of settled material that is now enriching the water. But we would still feel that such deposition may be of a man-made origin. To justify this hypothesis we have been trying to identify what is a natural foam and what is an unnatural foam, and how to tell them apart. Similarly, what are natural deposits on shorelines and what is de facto pollution. We fully accept that this is all very hypothetical and it is going to remain difficult to prove it one way or another. The obvious conclusion may be to limit the addition of all ‘foreign material’ entering the lake either naturally or though our actions. This would include both sewage, slurry, mudslides, exposing rock strata known to be liable to leach oily deposits, industrial, chemical or cleaning materials, and run-offs from forestry and cut away bogs. Many of these possible sources of contamination are within our control, eg. 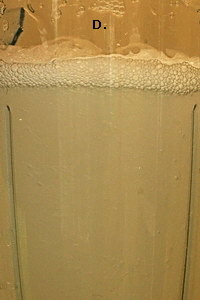 domestic and municipal sewage. Where can foam come from in the natural course of events and what materials occur in our natural environment that may be defined as ‘natural surfactants’? Typically people point to rocks, bogs, and forest plantations. Whilst following river courses and open mountains trying to identify sources for the recent foam epidemic, we have borne these comments in mind. Foaming has also been found in close association with free ranging animals. But this has always been very natural and non-persistent and is part and parcel of the ecology where cattle graze the shore or sheep on the mountains. We don’t believe it is a contributory factor to the present situation. 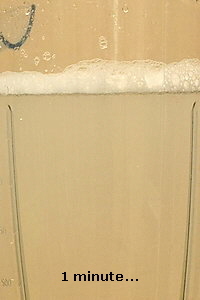 Water draining from bogs as well as being naturally brown and acidic is also prone to foaming. But this foaming does seem to break up when the stream enters calm water and no remnants remain. This is part of the dystrophic environment that may be an element of Lough Allen’s natural characteristics. Unless this has changed in some unimaginable way in recent years, it is unlikely to be a factor in creating a new style of foam, i.e. in visual and biochemical terms. Of course, rapid cutting of new or old bogs will allow much more run-off with increased flows of brown water to the lake but this will only be significant where such bogs are on the hills — and we have seen little evidence of such new bog faces being opened. Even if there were it does not seem likely that this would be a source of large amounts of dense persistent foam. ii) Erosion and run-off from minerals, rocks, soils and substrate. In a stable ecosystem this is always a factor in terms of contributing to the quality of the water. Limestone being an obvious example where the whole nature of the lake is different to Lough Allen which is largely a lime-free lake. In Lough Allen expected minerals to be found would include iron in abundance from the ironstone bearing sandstones on the top of the mountains. Rivers often run orange (or Yellow!). Soils and shales both can produce oily effluent which can be seen on beaches here and there around the lake. These can look strange and unusual but are, in fact, perfectly natural. The rare orchid, Irish Lady’s Tresses has been successful where these effluents occur! 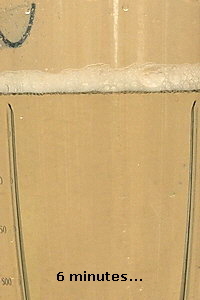 The picture, below, shows such a seepage from near Kilgarriff, associated with a foaming episode. This might make you think that the two were directly related. Probably not so! The seepage is nearly always present and the bay is normally perfectly clean and free from any visible sign of pollution. Foam also occurs on the upper slopes of Corry Mountain in very wet weather. This could be associated with disused quarries in the area, or it may be associated with sheep — though the quantities would appear excessive for the amount of grazing going on. Large amounts of persistent white foam have been seen in a stream in this area several years ago, but not in the past couple of years. If the theory that mineral or shale material can contribute to persistent foam development (and we have our doubts) the unfortunate mudslide occurring during the installation of new windmills on Corry Mountain must also be borne in mind. Apparently this led to significant quantities of detritus being deposited in the north end of the lake? 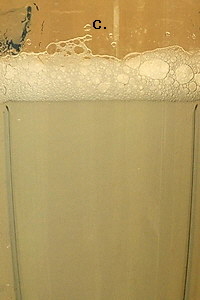 Foaming is typically associated with coniferous forests. It can derive naturally from resin and also will be produced from large amounts of decaying needles and branches. Increasing the run-off from forests by clear felling right down to a stream will immediately increase the problem. Also forest machinery and re-planting may contribute to adding materials to the environment that are not natural and may be surfactants. We have in recent months checked all rivers entering Lough Allen for visible signs of foaming, both those where there has been recent significant forestry activity (like Yellow River) and others, and have not noticed any evidence of increased, or unnatural, persistent foaming. There are numerous technical measures for monitoring pollution in a lake like Lough Allen. These are applied by the EPA on a routine basis and, we believe, on a heightened basis following a request from Leitrim County Council pursuant to our concerns. Both they and the Fisheries Board have expressed to us the difficulty they face with either chemical or physical analysis. It is simply a question of dilution. 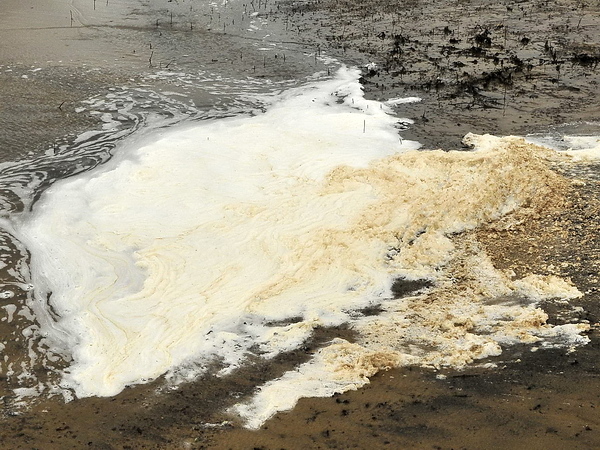 Whatever agent is contributing to the pollution is so dilute by the time the resulting foam or shore deposits are detected, that it is simply immeasurable by technical processes. However, the response of the environment can be very obvious (in ways outlined above)! Can this be a means of monitoring increasing contamination or appreciating an ameliorating situation. Recording the percentage of a coastline with significant deposits of persistent faom? Or trying to assess the area of lake water with floating scum (of an apparently unnatural source) or showing the presence of early or mid-level blooms — hopefully never full grown algal blooms? Anyway, the crux remains. Can we identify foaming that is the result of natural products, even those which are exposed in a most unnatural way? Or, can we establish and prove, by visual means, whether a contamination is from a man-made, entirely non-natural, source. This would be extremely helpful as it would indicate that Lough Allen was, indeed, suffering from creeping enrichment by extraneous material, and that this would likely lead to a major problem in the future. By the time foam, for example, lands on the shore, it will have been exposed to the elements and any hint of smell will be gone. At source, smell can be a vital clue to the nature of an additive. Frequently, around the lake, one can smell agricultural by-products, typically slurry being spread, or else from cattle directly grazing on the shore. This has never been a problem and farmers have been noticed deliberately avoiding spreading slurry close to ditches — a very conscientious code of practice. “This interesting picture was taken on the day we surveyed most of the north end of the Lake collecting our ‘dirty pictures’! The material at the top of the picture is natural; we know that from past experience. It is an aqueous oily mix produced (we believe) through anerobic bacterial action in muds near the shore which are interleaved with sand and organic material. There is a small sandy beach in the area and this seems to have come and gone, covering up layers of leaves and twigs with alternating layers of mud and sand. 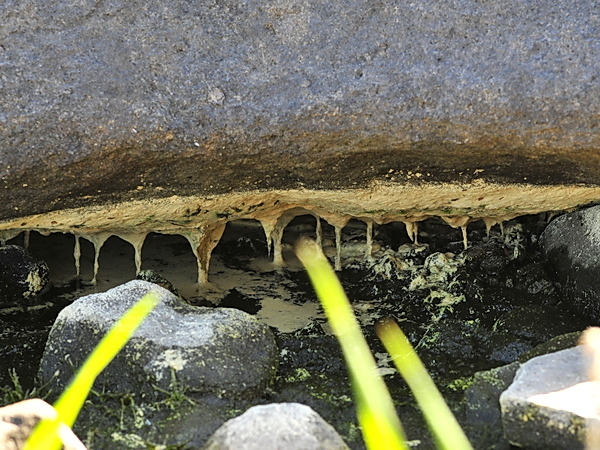 This shiny ooze is quite persistent in the area even in very dry weather. Yes, we have invented a test, a very simple one, but it may help you to tell possible natural sources of effluent from synthetic ones. Of course, excessive run off of enriching material from farm forest and mountain, is also undesirable, but we strongly believe much of the present problem we are seeing relates to a contaminant of a less natural and a chemical source. Please PROVE US WRONG! All these photographs show the results immediately after agitation was ceased. This is because the top 2 photographs showed very little foaming and what did occur was in the form of big bubbles which disappeared almost instantly! These images show the impact of 1 drop of Washing-up liquid in 1500 mls of rain water, and a similar amount of Washing powder. Sample C shows a huge volume of resulting foam which lasted for many hours! PERSISTENCE: Foam, particularly from Test C was persistent, very white in colour, very dense and strong and consisting largely of very small bubbles — all very analagous to what we have seen on Lough Allen. 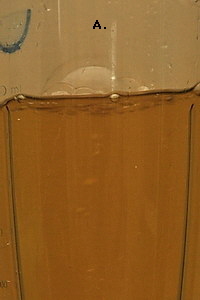 A further test was applied to a Washing-up liquid sample. 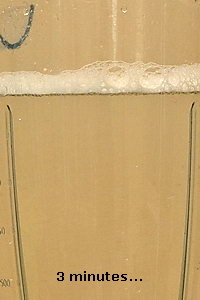 Sample was prepared as above but photographs were taken of the one sample over a period from 0 - 10 minutes, to assess persistence of the foam. A characteristic of the foaming that is concerning us on L. Allen is its persistence, whereas any natural foaming we have seen disappears in a matter of seconds? As you can see this foam is very persistent with a large percentage of the foam still present after 6 minutes and very little sign of further loss of volume and bubble collapse after 10 minutes. These simple tests convince us more than ever that the occurrence of a new type of foam on the shores of Lough Allen in the past several years but particularly this year (2011) is a sign of some detrimental additive building up in the Lake and that this additive is probably of a synthetic or man-made nature. Such Measures are suggested in the next Section! It would be great to see them implemented. In the meantime, the concepts presented above might be some use in helping people to keep an eye on Lough Allen. It is by no means guaranteed to remain clean and healthy forever. Anyone with information on possible pollution instances like we have explored here is very welcome to CONTACT US. Just some further thoughts to wrap up this Section. 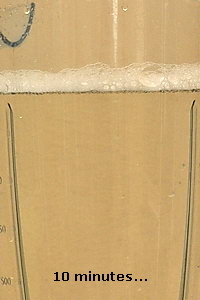 The sample used for the Persistence Test above was left stand overnight. All the foam had ‘evaporated’ by then. Where had it gone? (Curiosity is a terrible burden!) Nothing had been added or removed from the container, yet the water looked perfectly clear and clean? So we agitated it again. It immediately developed a head of foam very similar in quantity to the previous day, possibly marginally less though this was not measured. Also, the persistence was the same and the foam was equally slow to break up. 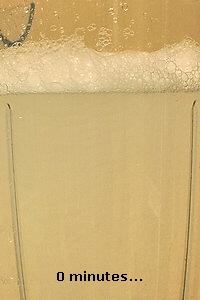 The conclusion, obviously, is that the surf creating agent (in this case, Washing-up liquid) remains in the water but is not apparent until the water is agitated. How long will it remain effective... 3 years? It’s impossible to say but it is clear that this particular surfactant is persistent both in its solid (foamy) form and its latent form dissolved in the water. a) this has the ability to produce huge amounts of foam. c) it can clear up and become invisible when water is calm, but remain latent for an unknown period. d) has qualities no other surfactant, natural or artificial, seems to match? Now, consider the weather factor. Lough Allen has had the coldest Winter for a long time. (See our Winter PHOTOS) It was calm and sunny and very beautiful but exceptionally cold both day and night, and dry! The cold spell started in early December, was extreme over Christmas and continued into February. Then, a less memorable phenomenon, a long dry period more or less until early May. April was a warm and sunny month with the Lake dropping to unseasonally low levels (1.8M at the Drumshanbo lock). But this dry period was marked by persistent strong winds, firstly easterlies and then for a while southerly. The photographs of foam on the north shore shown above were taken during these southerly winds and the foam was seen to be blown all the way up the length of the lake. This might indicate a recent source of pollution in the Drumshanbo area; it would rule out a north shore source. However, could it be possible that the material generating the foam had been accumulating for many years and the remarkable weather triggered it? During the freeze up many parts of Lough Allen were frozen, particularly in inlets and small corners of the lake. This would have totally calmed the water underneath leading to precipitation and deposition of suspended (or, possibly, dissolved) material in the water. During and after the freeze-up, the water level continued to drop and was exceptionally low (for the time of year) by the start of April. It is known that many areas of the lake have very shallow bays, eg. around Inishfale and Drumshanbo, where the Shannon and Diffagher rivers enter the lake, and at many other coastal fringes. The amount of water covering such areas could have been halved at this stage. i.e. they could have gone from 2 metres to 1 metre. The southerly wind experienced in early April could easily have generated waves with that reach. They would simply have scoured such shallows, brought any deposited material back into circulation, and deposited it as the persistent frightening foam we saw along the lake but particularly deposited at Kilgarriff, the Shannon estuary, Rossmore, Corry Point and Corry Strand — all the areas where the blue deposits have since been found! Our thesis in brief, therefore is... material of a polluting nature has been entering the lake for years, it lay dormant out of the reach of normal weather, it was concentrated by exceptional weather factors, and was then agitated again by unusual weather factors? It is just a theory. It is also totally conceivable that there was a short term addition of excessive material (or an amount of material the Lake was simply not able to handle with reduced flushing due to the ice). Either way the simple lesson would seem to be... don’t put ‘Washing-up liquid’ into lakes! 3. Keeping Lough Allen healthy? Without sounding alarmist, it is very important to also be alert. There are definite signs of change in Lough Allen. It is unlikely they are all due to natural causes. They are progressive and have become manifest particularly over the past 3 years. They may not be considered extremely severe at present? They could become so. If pollution were to take hold in Lough Allen it would be unsightly, it would stop leisure use of the lake, it would be disturbing to both the local community and tourists, and it would reduce Biodiversity by reducing light penetration. Also it could poison the shoreline by leaving toxic deposits and it would certainly enrich the very water edge habitat required specifically for the rare orchid Irish Lady’s Tresses that are already under pressure for other reasons. Waters that may be clear one year, may have slight signs of pollution in following years, and may succumb to severe algal blooms after that, reducing the social and economic value of the lake. Because of its complex categorisation between a low and a medium nutrient lake, Lough Allen may be less tolerant of enrichment than other lakes. Because of its traditional economy and low population pressure, it should not be exposed to such a chance of pollution... there is NO NEED FOR IT! There is an old adage... Dilution is the Solution to Pollution. Total Rubbish! We don’t accept that... The care shown in managing the lake for generations in the past, both during busy commercial times and in quiet ones... that is the recipe to maintaining a healthy lake nowadays also. Lough Allen should be passed on to future generations intact and vibrant and pristine, as we found it in the 20th century. This is probably best seen as a responsibility of people together. We all need to be vigilant! State & Local Agencies / County Council / Fisheries Ireland / EPA / Community groups. All parties have a role to play. We as keen amateurs can observe the lake regularly and report what we see. The EPA and Fisheries can monitor fish stocks and water quality. The County Council would have conflicting interests with responsibilites in providing water, and sewage, and housing, and a role even in wildlife conservation and planning. These interests are often in conflict with one another. There are diverse voluntary groups and small businesses with a common interest in seeing Lough Allen remain unique and unpolluted. Community responsibility would apply alike to farmers and fishermen, to tourism and recreation interests, to conservation and educational bodies... we all need a beautiful and stable environment. We, for our part, in LoughAllenBasin.com see our role in observing and reporting! We are a small group interested in Nature and the Natural Environment. We don’t have any agenda apart from a a long term desire to see some provision made for the plants and animals that have been here for longer than we have. They are part of our Heritage too! It seems clear now that the vigilance shown by Agencies of State can benefit from the help and support of a concerned populace. From our recent contacts with such Agencies, it now seems that such support might be acceptable to them. National and Local bodies are all suffering from reduced funding, are restricted in the work they can undertake, limited in the way they can use public funding, and unable to take on any more extensive responsibilities than they now discharge. They may, indeed, have to limit the time they can allocate to monitoring and maintaining lake water. At this juncture we must express warm appreciation to men and women in Fisheries, the County Council, and the EPA for the way they handled our recent expression of concern for changing lake water quality as we observed it in our extensive travels around Lough Allen. No names... but you know who you are... and thank you! All parties listened, took details, viewed the evidence we submitted, and kept us informed. We believe additional monitoring may have also been implemented? We even received some kind words for our own efforts... very much appreciated! We are not entirely sure in the end whether we convinced them of our belief that the changes we see aren’t natural and are of concern... but that is why we are putting up this page. We want to show both the positives and the possible negatives as regards water quality in Lough Allen. We also hope to promote a change for the better. The community can help by keeping their eyes open. Many people do notice change; few may report it. Maybe when you are surprised by something you might think of what we say and maybe even some of our images and discussion may help inform your views on what is going on? We think it is probably best that we err on the side of concern... if in doubt shout it out! Report any foams or brightly coloured deposits you find on the lake shore, or any scum or clearly visible areas of floating algae out on the lake, be they green or blue/green. You are very welcome to give such information to us and it will be useful to us in providing a wider picture. We can be contacted HERE. As a project, LoughAllenBasin.com would be very interested in working with public and community agencies in a supportive and constructive way to monitor both water quality issues and issues of Biodiversity which make up the majority of our work — conserving the very rare plants and animals found around Lough Allen. For further details of our work please have a look at our 2010 Report. To end this Report, let’s make one positive plea. This is in full recognition of present fiscal difficulties and of the sensitivities involved. It would be highly beneficial to all if the Sewage Treatment Facility in Drumshanbo was upgraded. This has been planned but is long delayed. We make no charge regarding the existing facility but it would undoubtedly be a considerable benefit to the Lake, to users of the Lake, to the town, the community, to the Tidy Town campaign, and to the broader region. Maybe it’s time for the community to work together to help in the installation of a Reed and Willow/Alder bed adjacent to the treatment plant to purify the water leaving the plant before it enters Lough Allen. Such a facility has recently been installed in Keadue and the quality of the water now leaving it looks good enough to drink. Certainly the environment of Lough Meelagh (into which it flows) is looking very clean and healthy. The photograph (left) was taken last winter very close to the now clean outlet from that treatment plant. How much would it take to acquire a hectare of land, build some leveés to hold water at a constant level, plant reeds and some trees around the edges, divert water from the treatment plant into the pond and use the Mill Race to maintain sufficient height of water automatically. This is not sophisticated engineering; it is simply appropriate and highly effective ecology! As icing on the cake, such a facility could easily serve a dual function as a Town Nature Reserve attracting further visitors to Drumshanbo and the Hotel. A major conservation issue for Lough Allen is its fluctuating water levels. An area of constant level would attract Swans and Ducks in winter, many breeding birds in the Reeds, and would be an ideal base for encouraging another of Lough Allen’s very rare breeding species, the Common Tern. These are at present trying to breed on a small rocky shoal south of Cormongan but are vulnerable both to flooding and to marauding Lesser Black-backed Gulls. In many parts of Britain and Europe such facilities would be the norm and to bring wildlife right into the centre of town would be a great boost to Drumshanbo. It is very do-able, very cost effective, will prevent us incurring expensive EU fines; it will be a huge benefit both to the town of Drumshanbo and the Lake as a whole. We have the information needed; why not... just do it? If you have any questions, or comments, or ideas... we would love to hear from you. Many thanks for reading so far. We realise that there is a lot of conjecture and personal opinions in this Report. Periodic News Items (good and bad) regarding the current status of Lough Allen’s water. Throughout the Summer (2011), since we have put up this page, almost every day we are out on the Lake we have seen some signs of pollution. We still believe in our thesis that.... something is amiss! And we would dearly love to know what it is? Let’s be clear, on a calm day in sunny weather you may travel for miles and see no visible pollution. But then on a windy day we come across persistent foam in a sheltered bay, or in hot weather we see incipient blooms of blue/green ‘algae’ on the shoreline or in calm water near the islands, or we see large amounts ‘natural foam’ (along with rubbish) coming down the Shannon and drifting into Lough Allen. But, then a day like this comes along! Thursday 18th August 2011 at 6:50 in the Evening. ADVISORY COMMENT: Possible Algal Bloom! Take CAUTION when entering Lough Allen or allowing your Pets or Children play in the area during HOT weather or after hot weather. We have reason to believe that there is now so much nutrients in the lake, as evidenced by the rapid generation of foam with wind or even a slight breeze, that this will trigger a bloom of Cyanophyceae, may stimulate the release of toxins, and these toxins may drift ashore. THEY ARE HIGHLY TOXIC and not always visible. On the 30th of May we made a boat tour of the north and north west parts of Lough Allen. We were looking for signs of an algal bloom following reports of an incident at the north end of Lough Allen on Monday, 28th May, during the recent extremely hot spell. Two dogs which had been swimming in the lake, died shortly after coming out of the water. The temperatures on that day and for several preceding days was in the mid to high 20’s. The owners and their families were naturally extremely upset as these were family pets and died in a horrible way. But there were many people, adults and children, who were swimming in Lough Allen during that hot spell and local people have reported that children came out in spots/rash over their bodies after swimming in the area. We have good reason to believe that the cause of the dogs’ deaths may have been a bloom of toxic Blue-green Algae (as they are often called). Unfortunately, we were out of the country for a few days or we would have been out on the lake; although we are voluntary workers we are present on the lake water and shore more than any other agents. We have been concerned over the growing levels of pollution in the lake over the past few years and have reported our observations as accurately and fairly as we can. We have hoped for urgent action to restore Lough Allen and to limit the detergent effluent entering the lake, from wherever it comes. This action has not been forthcoming. A bloom such as this occurred in April 2011 in mid-lake, at a time when temperatures were also quite high and the water very calm. This was observed visually and no ill effects resulted. (See photo). The death of family pets, especially in such a sudden, shocking and painful way, is simply not acceptable, neither is the risk to people who live by the lake or use the lake. This has been a clean lake in the past; why now are we constantly seeing pollution around its shores, and how many other incidents like the one on Monday are needed to prove that this pollution is serious! The lake, which on Monday had been quite calm, was slightly ruffled today, and this would have the effect of dispersing any bloom. On the small stony beach at Corry Point, there was some foam on the shoreline and also some foam spots further along the shore. Out on the lake we saw no evidence of a bloom, but this was not surprising as there has been some wind since Monday and the air temperature has dropped by approximately 10 degrees. The water temperature however was up to 18.6°, about 7° warmer than recorded for our last trip a week earlier. We assume the water temperature may have been even higher during the prolonged hot and sunny spell over the weekend. We sought other evidence of animals dying and thought that possibly the Lesser Black-backed Gulls which have a breeding colony on Long Shoal, just off Corry Point, could well have been in the area of any bloom, so we went around the shoal by boat and counted the Gulls. Their numbers seemed to be about right, 22, similar to previous counts, with 8 nests and one hatching young. These all seemed healthy and no dead birds were seen. There was a fair amount of green algae (similar to that illustrated above) growing in the tiny ‘lagoon’ on this rocky shoal, and samples were taken for identification. 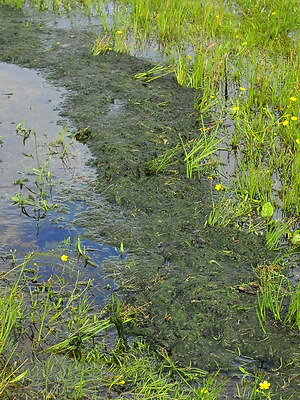 However, this is a harmless green Algae and normal to find it on or close to a colony of breeding birds. We checked out both of the Gull Islands (usual, small numbers of birds here) and then travelled west to take in Church Island and the small islands off this. All seemed normal around here and there was no evidence of blue-green algal blooms in this area of the lake either. Water samples were taken in three locations; the first (A) in between Gull and Little Gull Islands in fairly shallow water. The second (B) we collected in the stretch of water between Church Island and the Shannon River shore. The third (C) was taken between Corry Point and Long Shoal. These all seemed clear but will be microscopically examined to seek for any remnants of a bloom. Such studies (by ourselves) have shown only miniscule fragmentary presence of blue green algae. We believe any bloom or toxins will have dissipated by this stage. ...IN HOT CALM WEATHER, QUESTION IF THE WATER IS SAFE TO ENTER! In brief, dogs are more susceptible because they lick their fur after swimming and ingest more of the blue-green algae. In the intestinal system, the cyanobacterial cells break down and release the toxins, thus having a rapid effect. But livestock, particularly cattle, are also affected, especially young animals, which may drink from shallow water where the bloom may be concentrated. 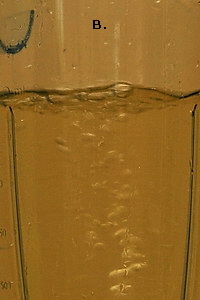 Older animals may go further out to drink. The WHO website (linked below) mentions some alarming blooms where people have got serious illnesses, including liver disease... China, Brazil, and Australia (the 'Palm Island Mystery disease) where drinking water was affected by blue-green algal bloom. Blue-green algae (cyanobacteria) are any of a number of species of microscopic bacteria that are photosynthetic. They may exist as single cells or groups of cells. They occur naturally in surface waters. When conditions are optimal, including light and temperature, levels of nutrients (i.e., phosphorous and nitrogen, and the ratio of the two), and lack of water turbulence, blue-green algae can quickly multiply into a bloom. Effects on humans and General information on Blue-green algal blooms. Blue-Green Algae: Hazard for Dogs. Treatment is primarily supportive in nature. Your veterinarian may administer activated charcoal slurries to absorb the cyanobacterial toxins from the gastrointestinal tract. Because the toxins are excreted rapidly from the body within a few days, animals that survive the initial tissue damage have a good chance for recovery. They have documented the toxic effects to livestock for more than 100 years. However, it is possible that the frequency and duration of blooms are increasing in some Wisconsin waters as a result of increased nutrient concentrations. Nutrients, particularly phosphorus and nitrogen, can be carried into water bodies as a result of many human activities, including agriculture, discharge of untreated sewage, and use of phosphorus-based fertilizers and detergents. Animals are not necessarily more sensitive to blue-green algal toxins than humans. However, many animals, such as dogs and cattle, enjoy being in the water, even if there is an unsightly green scum layer floating on top. When such a bloom is present, animals may consume large quantities of blue-green algae if they drink the water, and if those blue-green algae happen to be producing toxin(s), the animals can become very ill, and even die. Symptoms of blue-green algal toxin poisoning may range from lethargy and loss of appetite to seizures, vomiting, and convulsions. Dogs are particularly susceptible to blue-green algal poisoning because scums can attach to their coats and be swallowed during self-cleaning.